In early December, 2014, twelve bare-root bur oak trees (Quercus macrocarpa) were planted in a recently-cleared area near the northeast quadrant of the Bill Pavlus fishing pond on the old Federal Farm property on Old Seneca Turnpike. 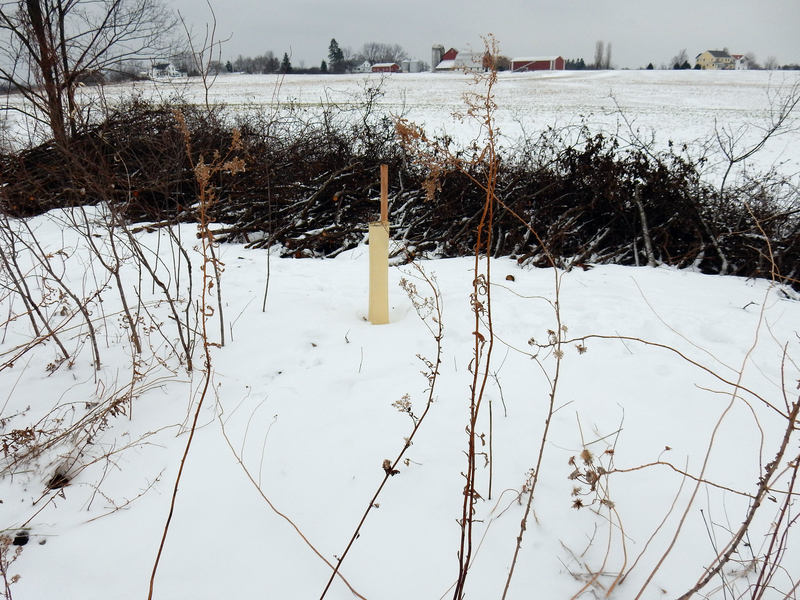 No previous reports of bur oaks have been found for any of the Skaneateles Conservation Area properties. 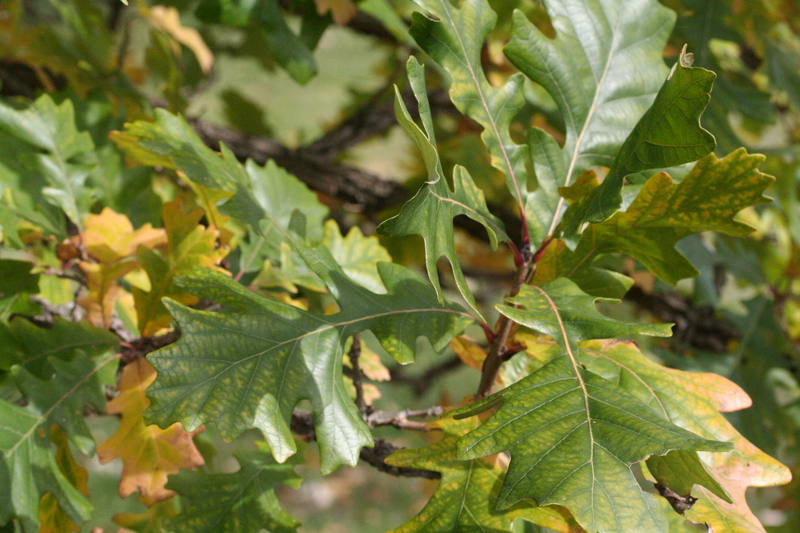 Bur oaks are however considered to be native to the finger-lakes region and are often planted as landscape trees throughout the Northeast and Midwest. The area where the bur oaks were planted had been badly infested with buckthorn (Rhamnus cathartica), which was growing among a few ash and black cherry trees, of various sizes and degrees of health. The buckthorn, along with some honeyscuckle, privet and multiflora rose, had been cut off near ground level and stacked nearby during the previous three months. There are also quite a number of small dogwoods, mostly gray, silky, and red-rood, and a few cranberrybush viburnums (probably the European variety) growing along the very edge of the “bucksuckle” infestation. These of course were all left in place. The bur oaks were mostly placed away from those Dipsacales shrubs to allow them to spread a bit. 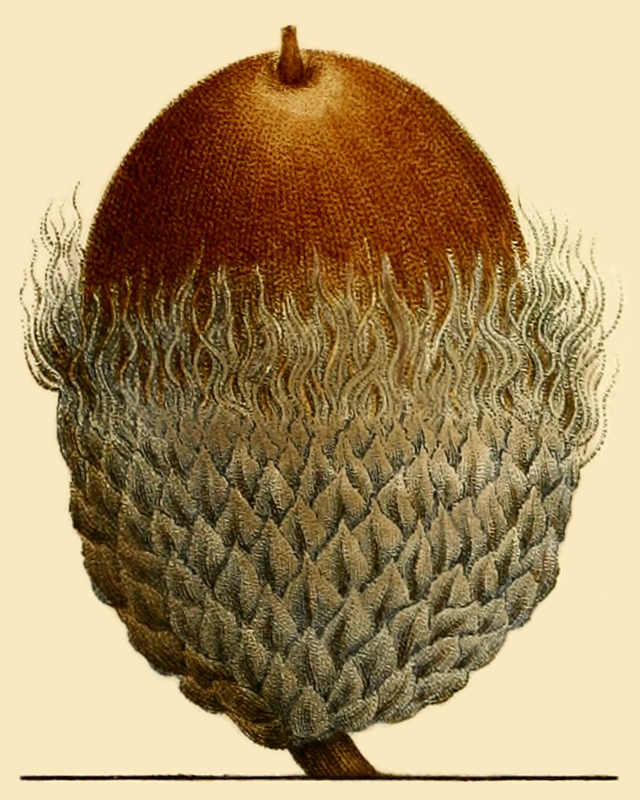 Bur oak acorns from Histoire de Arbres Forestiers de l’Amerique Septentrionale by Andre Michaux, Vol. 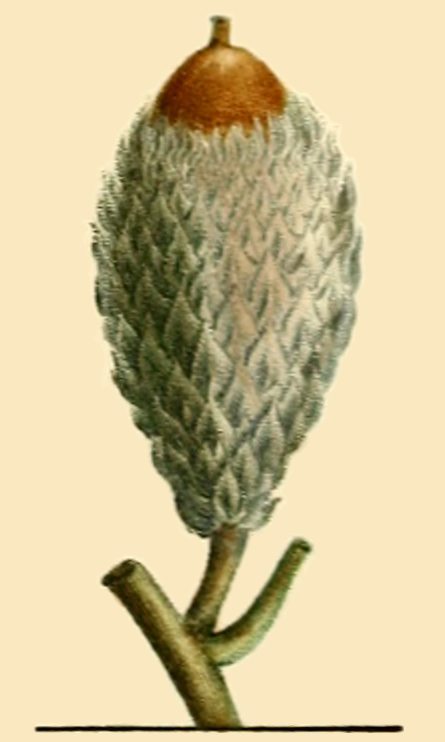 I, 1813. There will most likely be a problem with buckthorn root/stump re-sprouts, which will need to be managed for the next several years. This will probably be done by periodic re-cutting using a brushcutter or pruning shears. 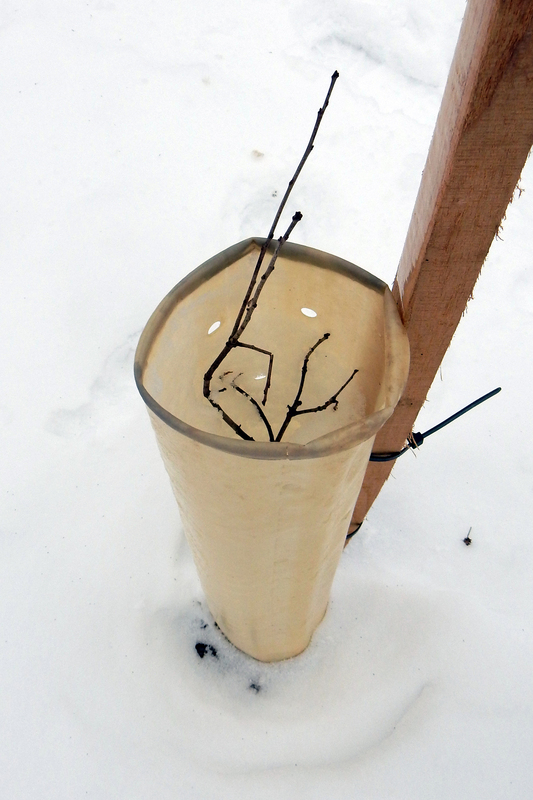 A few of the bur oak seedlings were planted in 18-inch shelter tubes, which were not high enough to fully contain the trees, some of which were closer to three-feet high. Because deer are known to browse bur oaks, the shelters should probably be replaced with taller ones. Or perhaps wire cages could be added, as was done with our chestnut trees. These trees were planted on the outside slope, near the top of the berm that contains that section of the pond. Most were planted within twenty feet of the mowed grassy area on top of the berm. The soil seemed to be quite variable. It was probably placed there during the digging of the pond in the 1950s or the expansion of the pond in the 2000s, so its source is not known, and it may not match the soil type shown in maps for that property. But bur oaks have been used for rehabilitation of strip mines, so they may be appropriate for this particular spot. Bur oak seedlings in tree shelters on the east side of Bill Pavlus Pond. Dec. 21, 2014. The brush pile behind is primarily buckthorn that had been remove from the location. J.M. Row, W. A. Geyer, and G. Nesom. 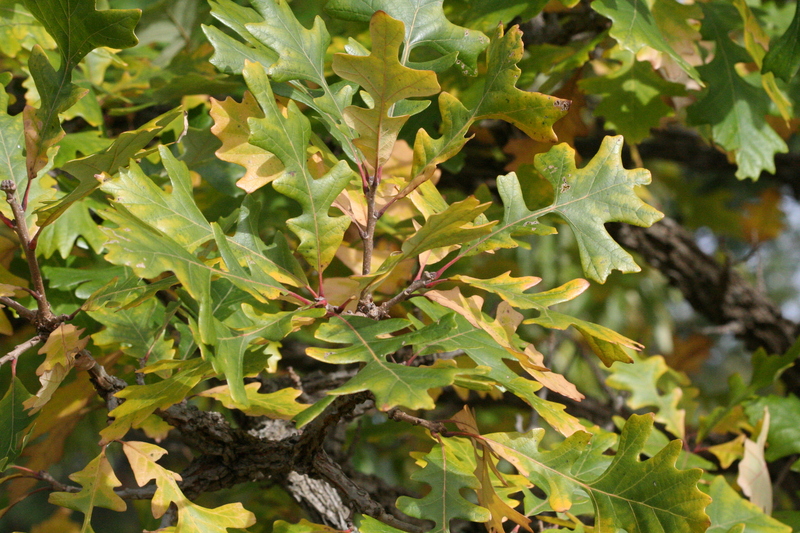 (2012) “Plant Guide for bur oak (Quercus macrocarpa Michx. ).” USDA – Natural Resources Conservation Service, Manhattan, KS 66502. Nov. 2012.